This race book is a kind of carbon copy of many years for Ern. 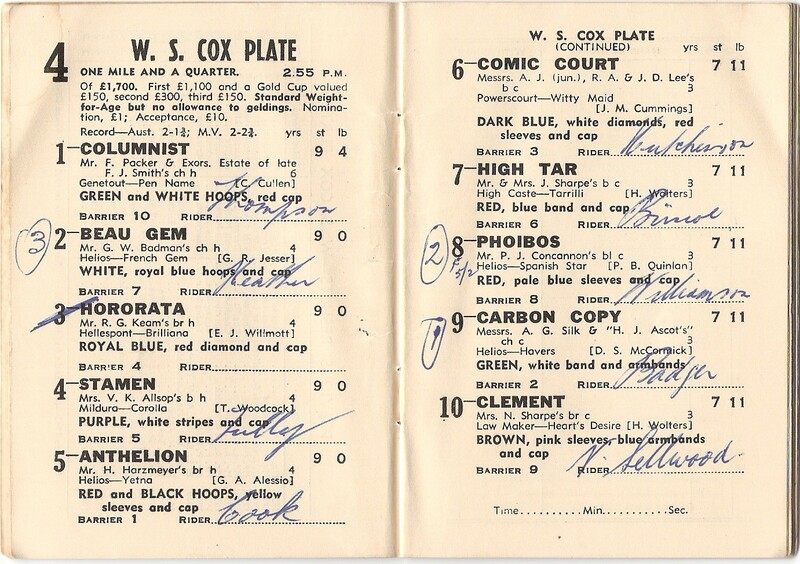 The W S Cox Plate for 2014 has just been run at the time of my writing of this post. 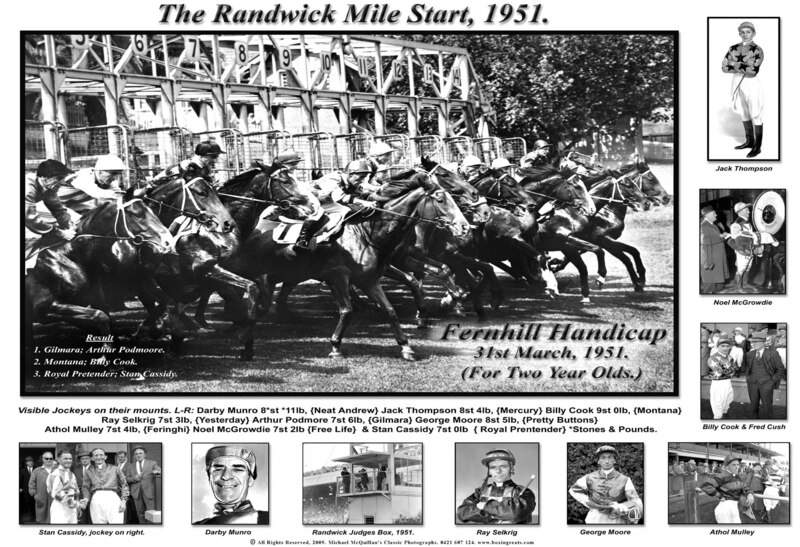 Ern and I feel we owe the remarkable Cox family the respect of beginning this post with a link to its position in the Racing Hall of Fame. Perhaps you will follow that link as time suits. And now back to Ern McQuillan’s links with racing history. So the years have moved relentlessly on for Ern, as they do for all of us. War after war, season after season, he was there with his heavy camera and the few resources he was allowed, telling us through his own artistry what had happened in places where we couldn’t go. Now the reputation of the media has become somewhat tainted in recent times. The truth there is often elusive and clouded by agendas of powerful people. Not so the images Ern has left us. They are for me one source of uncontaminated truth.That is the excitement I have found in the time I have shared with him in these later years. One of the greatest joys has been Ern’s insight into racing. That is why, as the Victorian Spring Season is with us again in Australia, I thought I must share some of that joy with you in this post. I am going to let Ern’s pictures do most of the work. Ern was there in 1951. It’s his picture.Michael, his son, arranged this layout. This picture is a remarkable collection of images of the great Sydney jockeys of the Fifties and later. Ern knew them all and was a close friend of several, including their families. The Munro photo is a result of a special request from Darby for a BCU. As Ern put it to me, “He was not exactly the most handsome of men.” It’s a lovely, warm photo however. The “Demon Darb” was very pleased with it. Me too. The shot of George Moore actually hides tennis shoes, socks and shorts. Ern interrupted tennis at George’s home with a request for a picture in colours for the next day’s edition. George willingly interrupted the game for his friend but requested no jodhpurs—such a nuisance to put on and take off. 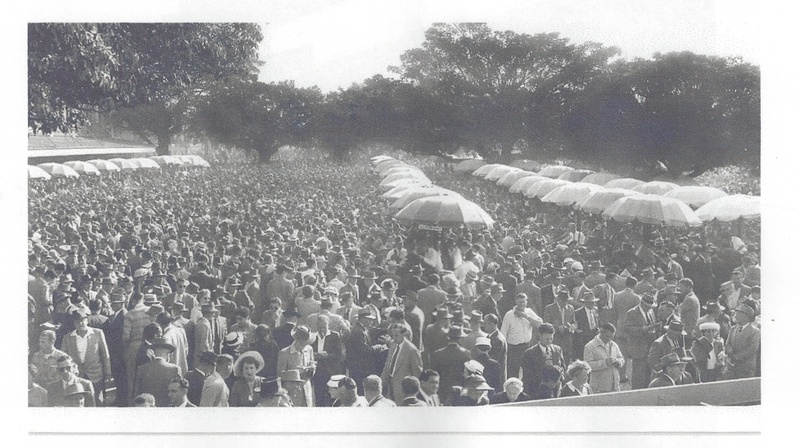 Ern’s Picture of the crowd on a big race day at Randwick in 1953. The times do keep on changing. Ern’s visual record shakes us with awareness of this change. These recollections from Ern’s and my life’s journey might bring this awareness a little more strongly into your mind. We remember when it was illegal to bet outside any sporting venue. 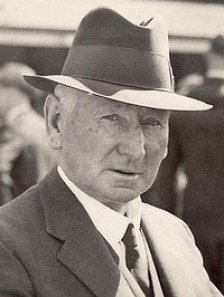 With racing, for example, so keen were the owners of racecourses to make you attend, that radio’s race callers were prohibited from entry into the courses. People like Ken Howard and Cyril Angles in these prohibition days had to call the races from long distance, perched in precarious vantage points such as trees or hastily erected platforms or rooms with windows, all OUTSIDE the course. In time, the pressure became too great and they were let in. 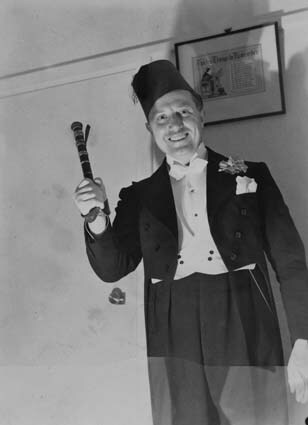 Here is Ken Howard calling the 1941 Melbourne Cup. What a joy to hear that voice in 2014! How lucky we are government archives have given us this site! 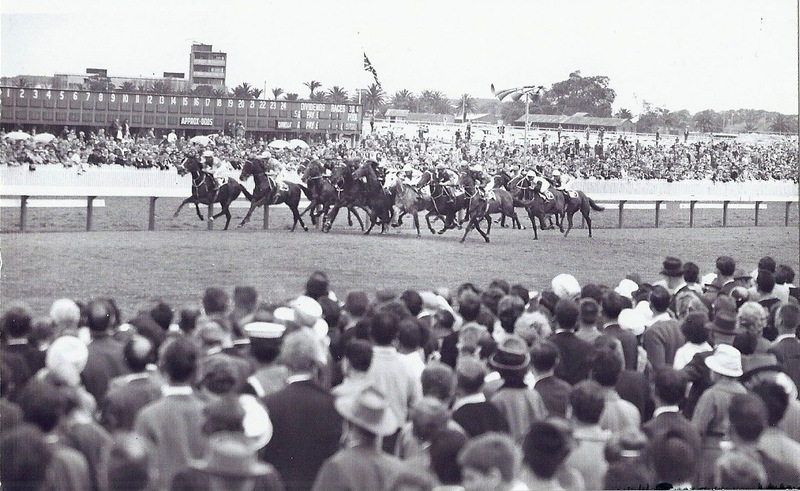 Radio stations in the Forties and Fifties were not allowed to broadcast the prices of horses until after the last race. Nor were they allowed to give any indication of favouritism or betting markets. Television and TABs et al. were future dreams to come true. SP betting was big business throughout Australia at this time. John Wren, for example, the famous business man, political figure, and enemy of Frank Hardy, got his start through SP Betting. As a Newtown kid like Ern, I remember the SP runners. Mine, in Georgina Street, was a thin little chap wearing sandshoes, quite thin and pale with an anxious look on his face and constantly glancing behind him like an escaped, present day asylum seeker. My “mob” lived in a three story tenement and we would lower our bets from the first floor balcony on a long piece of string. If we won, we would collect our winnings downstairs with the front door half open. The Totalizator (Off-course Betting) Act 1964 (Act No.1, 1964) changed all of this. What a different world we have now! No need for me to tell you about that. Here’s Ern’s next image from the past . Racing as the crowd above would have seen it. Notice the Flat opposite the members’ heads in the foreground. No longer available to spectators (the Flat I mean, not the heads). The Flat was where I went—it was the cheapest viewing spot. Have you ever thought of how big attendances at venues were in those pre-television days? That was the only place you could see the events as they happened. I remember attendances over 60,000 at Sydney Cricket Ground – lots of standing, a few on the Bob Stand roof and some even next door on the Showground stand. Do you see the running rail space before the leading horse in the picture above? That was approximately Ern’s special spot to take the next picture below. Ern’s Image: “Around the Bend” – literally, not metaphorically. The stewards gave Ern permission to enter the area near the winning post. Photos were important PR and the racing staff trusted him. There he went then, lugging the heavy camera of the time with telephoto added. When the field thundered around the bend, Ern was there. Well not precisely there. He, with the basic (non-digital) tools of his time, including a telephoto lens, was 410 yards away at the other end of the Straight (beside the winning post). Here is that finish, taken from the same place I showed you, but this time amidst the thunder of the hooves and without telephoto. When the last desperate breaths of horse and rider exploded at the winning post, to the beat of the whips, Ern was there with the permission of the stewards, resting just behind that winning post railing. 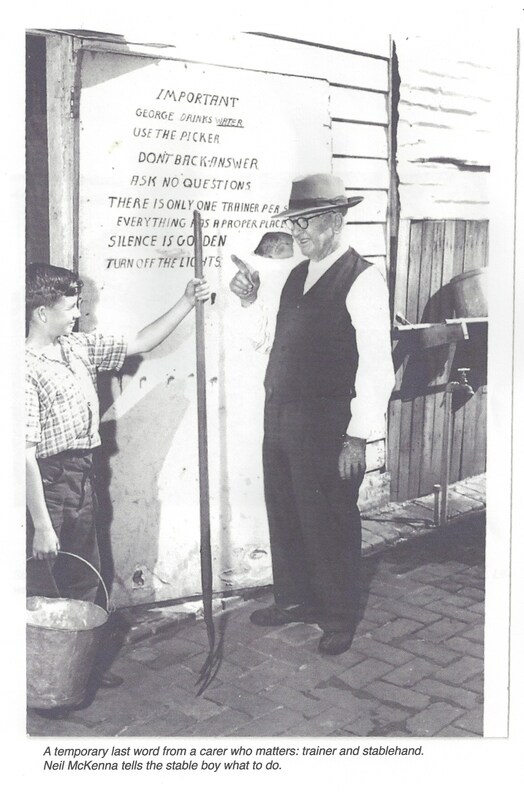 My grandfather on my mother’s side had a favourite saying: “I’ll be there when the whips are crackin’.” When I grew up a little, I really understood that was the kind of place a miner from far away Cobar knew about. That was where fates were decided. So there you have it. Jockeys are human. Neil McKenna, distinguished trainer of the post war period, taking the place of a parent. How much those jockeys needed love and care. They were children playing the role of adults in one of the toughest communities on Earth. 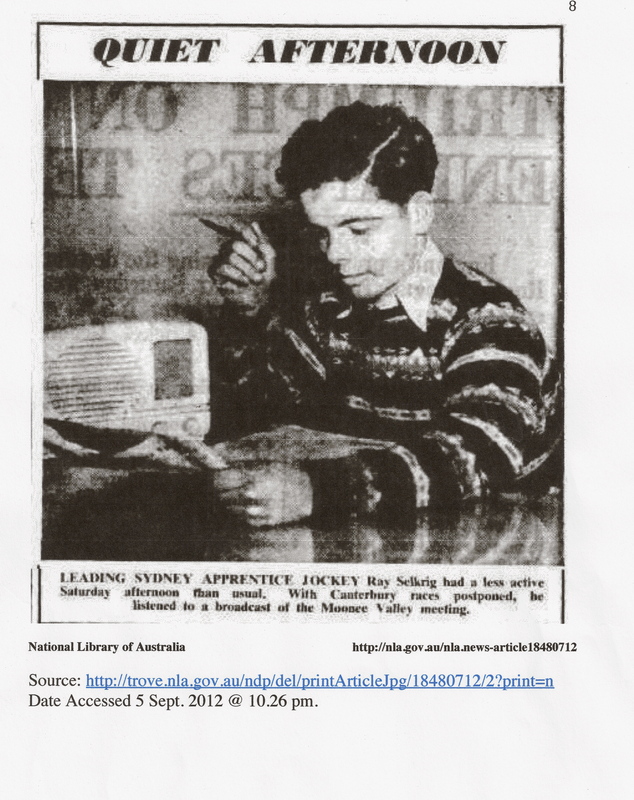 You will see what I mean if you patiently enlarge the image of the press cutting on this site I have given you (Trove). Every day for the jockey children was filled with early rising, hard work, danger and insecurity. Only a few succeeded. Many of them alas, shrivelled away into insignificance. So many of them, however, who completed the struggle successfully, were friends of Ern. Their stories are worth sharing. A few of them we shall share here in what space we have. Before we do, here is another of Ern’s glimpses into the life they led. 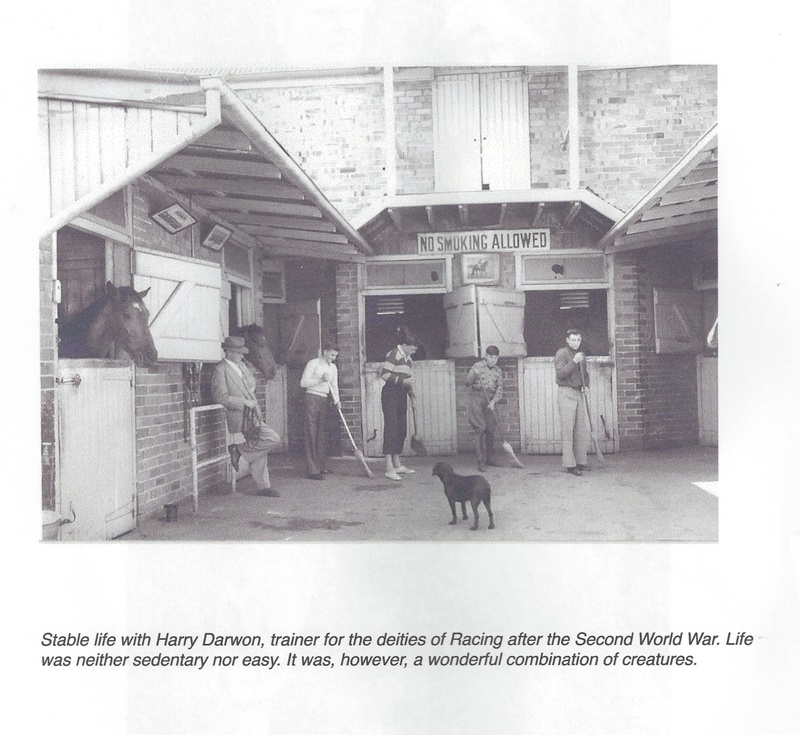 Here’s a nice little tale about Harry Darwon by the distinguished journalist Max Presnell. The press photographer of those times was a vital source of communication in Australia. Newspapers then ruled the roost now occupied by the social media and probably television. Managers, publicity agents and spin doctors were largely clutter for the future. For trainers, jockeys, stewards, owners, bookmakers and others, the photographer then was an important link, your pathway to public awareness. Most worked willingly with Ern and with a common interest. Ern knew so many, and very often as a good friend. 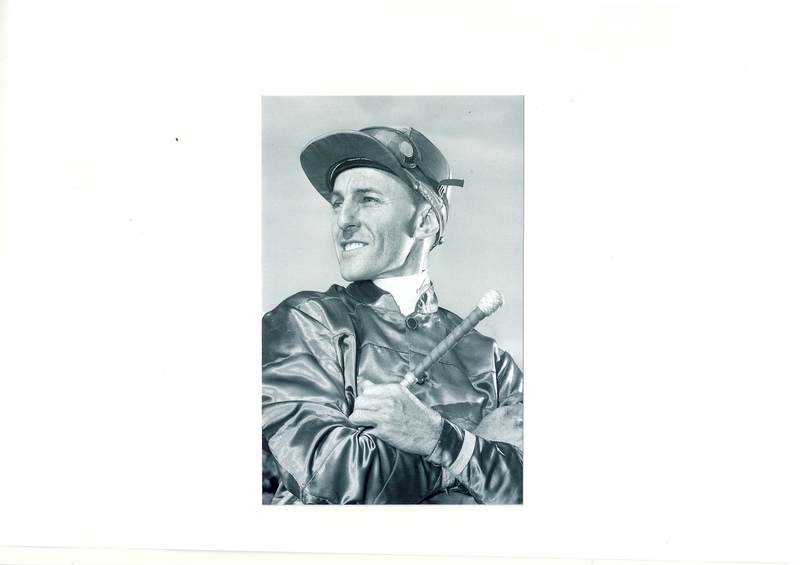 The jockeys: Darby Munro, George Moore, Athol Mulley and so many more worked with him for years. So too the trainers: Tommy Smith and daughter Gai. 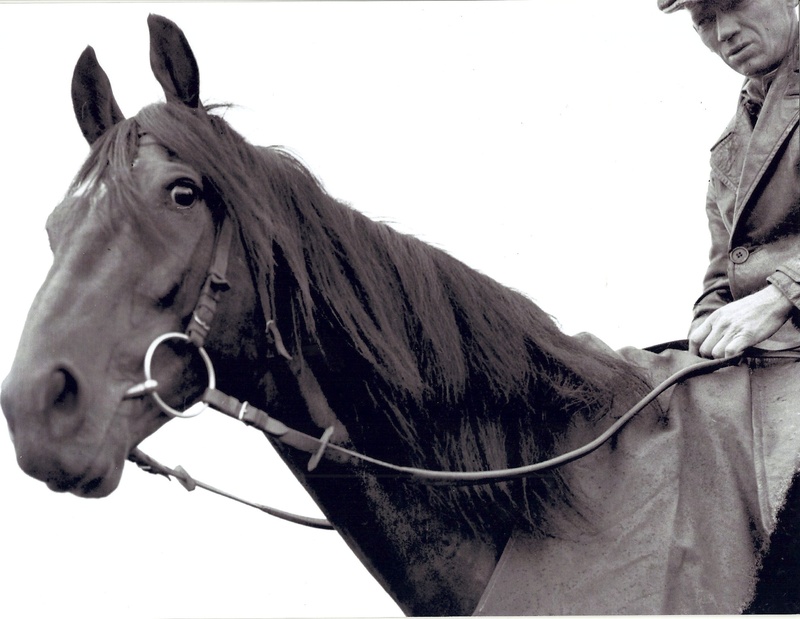 It was sad to discover that Bragger, Tommy’s horse that gave him his start as a trainer, died from a road accident. Tommy’s failure to save him, with the help of vets, broke his heart. Gai is still blooming as a trainer so I will leave discussion of her to a later time. Here is another of Ern’s pictures of her with another great colleague. Th image is overflowing with the human effort and tension of their work. This McQuillan image of the brilliant Bart reveals a great rapport between photographer and the horse-training genius. There are so many more trainers on our list; so many more. Owners too : “Azzalin the Dazzlin” Romano, Jim Bendrodt. many more of them too. Other personalities teemed in Ern’s life. “Hollywood” George Edser, Joe Taylor, Perce Galea (the three to be discussed more in a later post) and still more. Space here is totally inadequate. Let us focus on more of the pictures. The visual record of the stars of the racing world meant lots of early rising for the photographer. Many race meetings had to be attended as well. 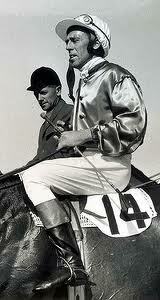 Here is a shot of two great friends, triumphant in the 1946 Newmarket Handicap. Bernborough and Mulley return to scale in triumph. 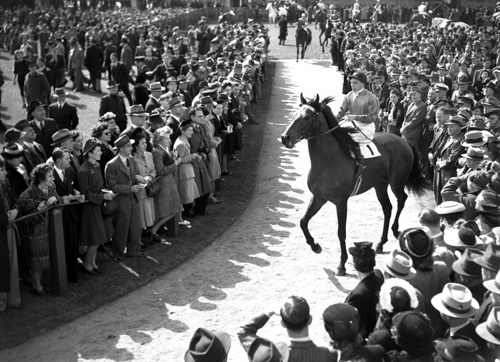 1946 Newmarket, Flemington with 9 Stone.13. What a career this was! I am lucky as a teenager to have seen this giant red horse thunder down the long straight at Randwick. To meet someone in my old age, who knew the horse and rider so well, somehow makes you feel that old age is not such a grim affair after all. Which brings me to another remarkable pattern of Fate. Ern had close and continuing contact with owner Romano as well. One of the great social advantages of press photography was a strong link with some of the most important people of our age. In his work for The Australian Womens Weekly, for example, Ern photographed Queen Elizabeth’s first step on Australian soil and later shook her hand. Another example lies in his societal work at Sydney’s leading restaurants. Take “Dazzlin’ Azzlin” Romano for instance, the man who bought Bernborough and set him on his 15 consecutive win journey. 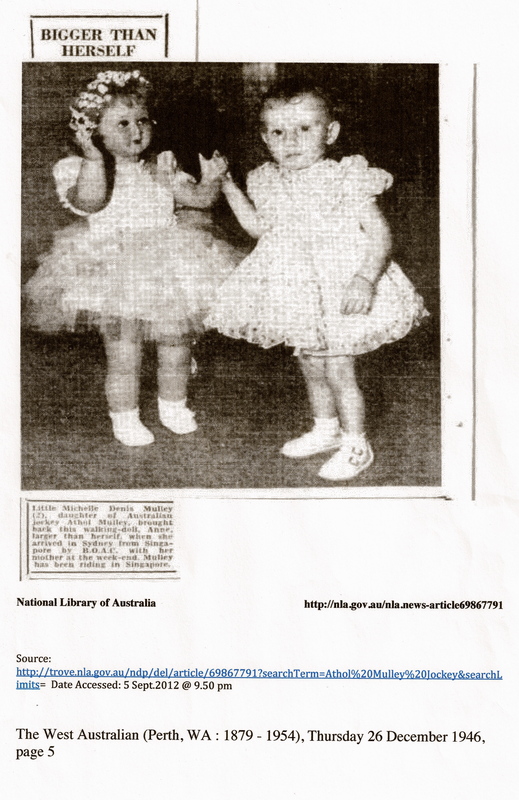 This photo we have through the magic of the National Archives of Australia. You can have similar adventures with so many images HERE if you want to. I first saw that shot on another wonderful site, Pittwater Online News. The links I have given are really worth following. They deal beautifully with the two big-time restauranteurs in Sydney around the time of World War II: AO Romano and J C Bendroit. So Malcolm Fraser got it wrong. There was such a thing. Things were very similar in Jim Bendroit’s Princes Restaurant, just a little way away in Martin Place. The free lunch was there too. In my younger days I used to ice skate at Bendroit’s Ice Palais in the old Sydney Showground. The crowded Trocadero, with its dance band music swinging through the night, was also known to me. As for the owner of both places, he might have lived on another planet. To talk now with someone who knew him so well, is in my twilight, a strange experience.There is no more space here to dwell on that remarkable life. I want to finish here with just a brief mention for now of some jockeys. Ern knew at first hand the gentle courtesy of the brilliant Neville Selwood, killed eventually in 1962, at the age of 39, in a fall in France. 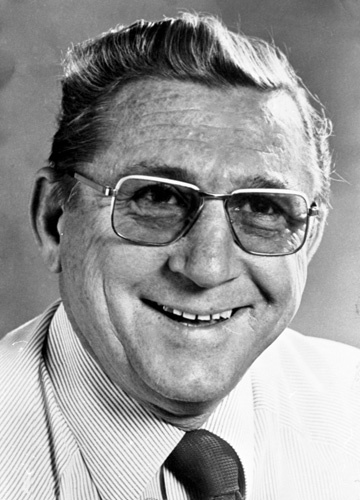 Selwood’s riding skill was well summed up by his popular title “Nifty.” “He was always quietly polite and willing to cooperate,” Ern told me. I remember “Nifty Neville” was my grandfather’s favourite jockey. He followed him closely and from what I could gather “Nanny” was in the black as a result. Many of us felt we had lost a friend when Neville died in France, as so many Australians had done in earlier times. 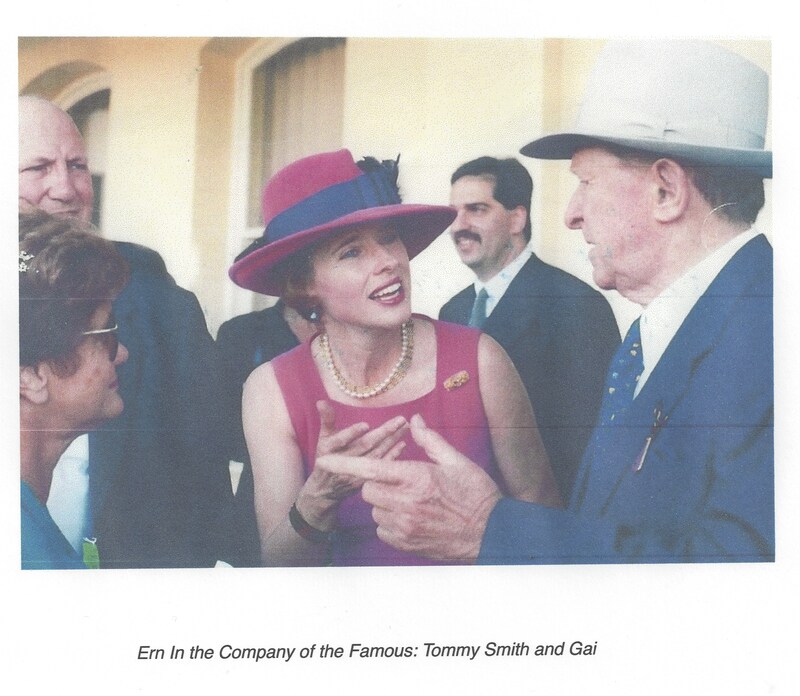 Because this great craftsman was a leading jockey, Ern photographed him and shared words with him many times. It is hard to shut Athol George Mulley out of your thoughts. A. GEORGE Mulley (with thanks to Wiki Commons). Here is a good account of that life. He apparently hated “Athol” as a name. He preferred his second one, GEORGE. He spoke more than once on the bond between rider and horse. Bernborough and he were one. The horse knew who it was when Mulley mounted in the enclosure. A welcoming and reassuring pat on the neck usually followed. Ern was at Mulley’s wedding to his lovely wife June. He knew the rider as a struggler with practical things, such as getting to the right race meeting on time, but as a dedicated family man. You will gather the truth of this statement if you visit this valediction. More evidence: this present for his lovely daughter. Little Michelle, Denise Mulley (2), daughter of Australian Jockey Athol Mulley, brought back this walking-doll Anne, larger than herself, when she arrived in Sydney from Singapore by B. O. A. C. with her mother at the weekend. Mulley has been riding in Singapore. Some More on the Racing Giant, Darby Munro. Ern tells me Darby was a strong, determined person to talk to. No airs, but a means business kind of chap. This cutting might show you that even in the last century, when money didn’t rule EVERYTHING, if you were brilliant in your profession, your opinion was both sought and heeded. Jack Thompson I remember well. “Quiet,” says Ern, “Always cooperative. 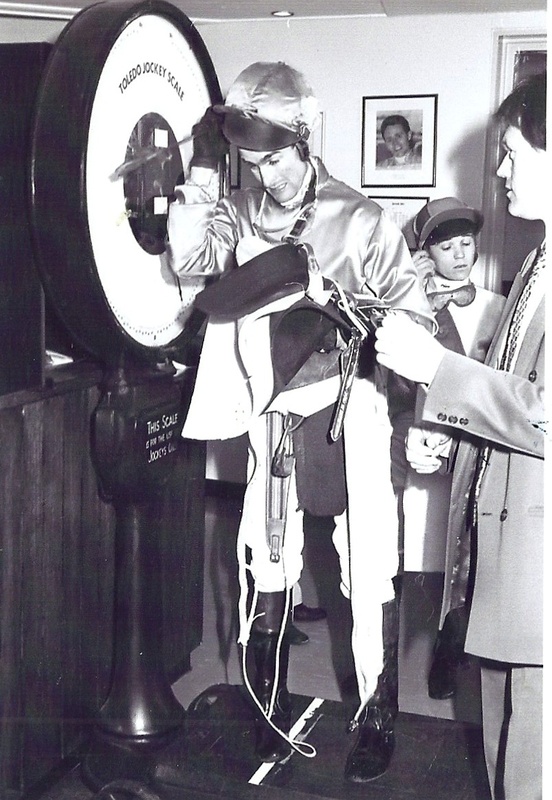 The tallest jockey I have ever seen.” Darby Munro supported him in his apprenticeship years. Downplayed his height and praised his timing. During that apprenticeship, Darby forecast a bright future for Jack. He was right. An example of Jack Thompson’s skill. 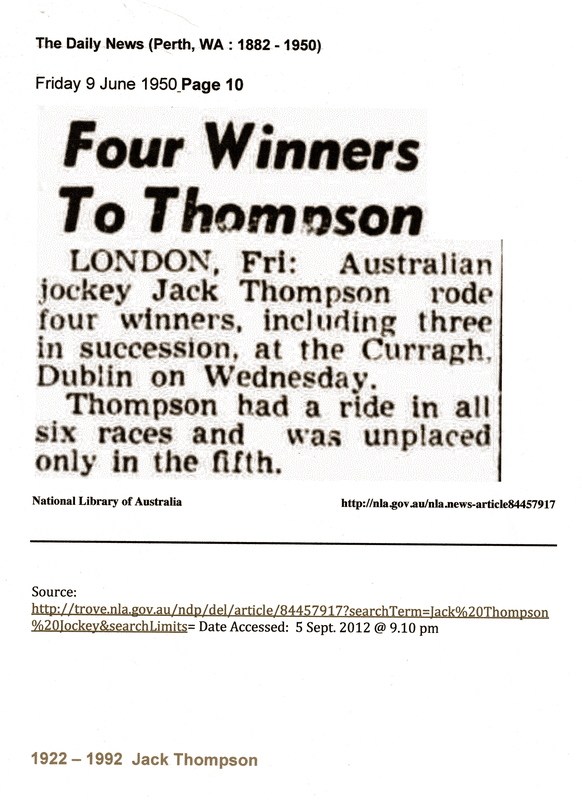 I myself remember a frightening day at Rosehill when his horse collapsed and died under him, and Jack Thompson broke his leg. Remember my earlier comment about the jockey’s harsh world? Ray Selkrig is another interesting and quite inspiring thought here. 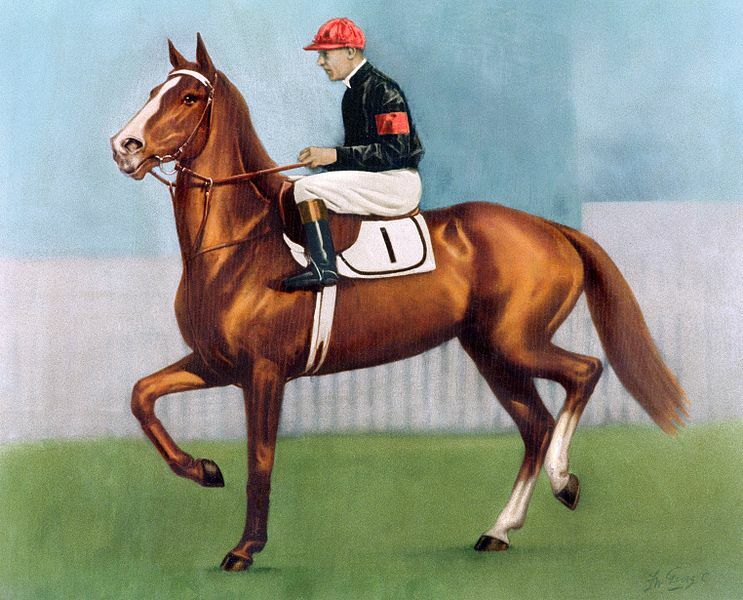 … his greatest triumph was in a moderate Kembla Grange race on a sprinter, Hot Chestnut. ”He was one of those horses who watched shadows on the ground,” Selkrig recalled last week. ”As we were near the post he seen this brown patch and propped. He just threw me straight out of the saddle. He kept going, I held on to the mane and rein and my feet hit the ground. 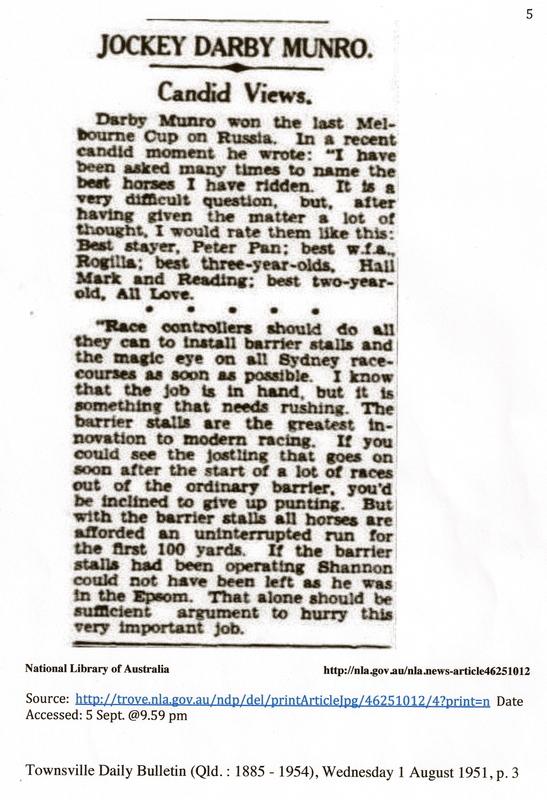 Objections were lodged and punters, myself included (Max Presnell), who backed the runner-up, trained by Jack Denham, were confident of being awarded the race, despite Selkrig’s courage and commitment, later confirmed as he had cracked his pelvis in three places. ”Stewards reckoned the horse done a harder job pulling me than carrying me,” Selkrig explained, and the result stood. The full story is beautifully told by Max Presnell, with a brilliant picture. His site is truly worth a visit. One more image: Darren Beadman after a taxing ride. Press photographers, unlike the rest of us, saw the humanity of the stewards rooms. This has changed now through the power and intimacy of television. Reluctantly I leave our jockey tales. More to come in later posts. There are so many wanting to be told. Back to horses briefly. Click the picture for a better view. 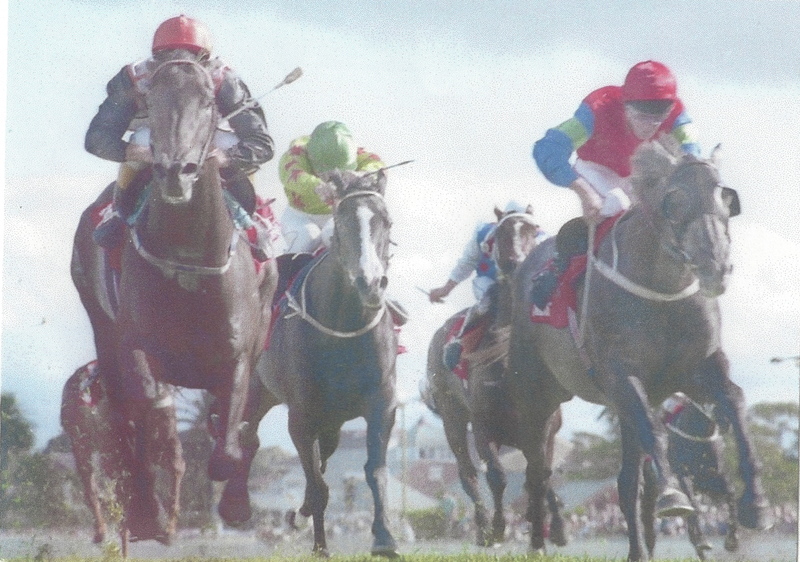 The first Australian triple dead heat. Ern was there. This is his visual record. “A thing of beauty is a joy for ever,” said Keats in his poem “Endymion.” I can’t help thinking of poetry here. Remember this image was not taken digitally. With the camera of the time it was one click and that’s it. The camera was heavy too, as I’ve said elsewhere. I have seen other pictures from different angles, but this is Ern’s. Another comparison surges from D H Lawrence’s striking description of horses in his novel The Rainbow. But the horses had burst before her. In a sort of lightning of knowledge their movement travelled through her, the quiver and strain and thrust of their powerful flanks, as they burst before her and drew on, beyond. To return to more routine matters, here are the details of horses and riders. 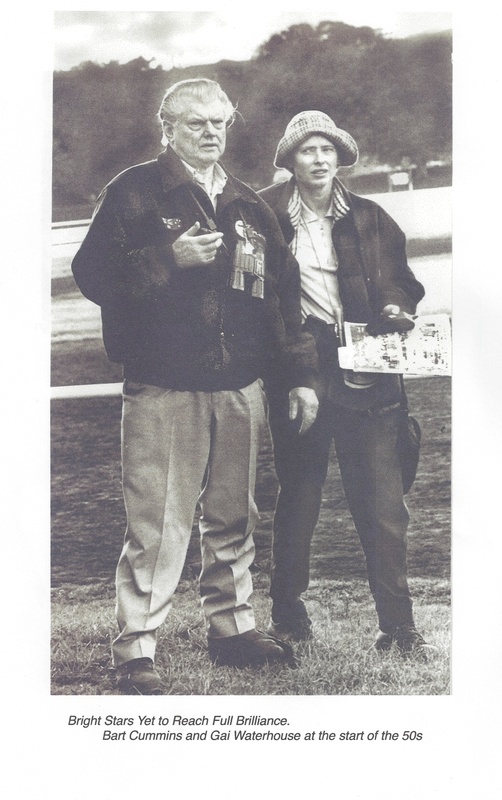 I have been reading, in David Hickie’s wonderful book Gentlemen of the Australian Turf (1986, Angus and Robertson, Sydney) about race caller Joe Brown’s involvement in the event. One of the judges, Stan Shannon, rang Joe to advise him it was a triple dead heat. The announcement brought a loud roar from the crowd and there was great confusion and delay with payouts. The official semaphore frame had space for only TWO numbers. Another judge, Dudley Zillman, had to hold up a number next to the other two (p. 317). Here is a nice story about this event. I have a friend I won’t embarrass with name disclosure. Like me he was a teacher in 1956 in an isolated bush school. He told me recently that, when school was over on that day, he rang another friend to see who won the Hotham. He was delighted to find his horse, Ark Royal, had won. Joy soon turned to sadness however when he heard of the other two winners. He actually lost on the race. Incidentally, do you know why we use the term DEAD heat? 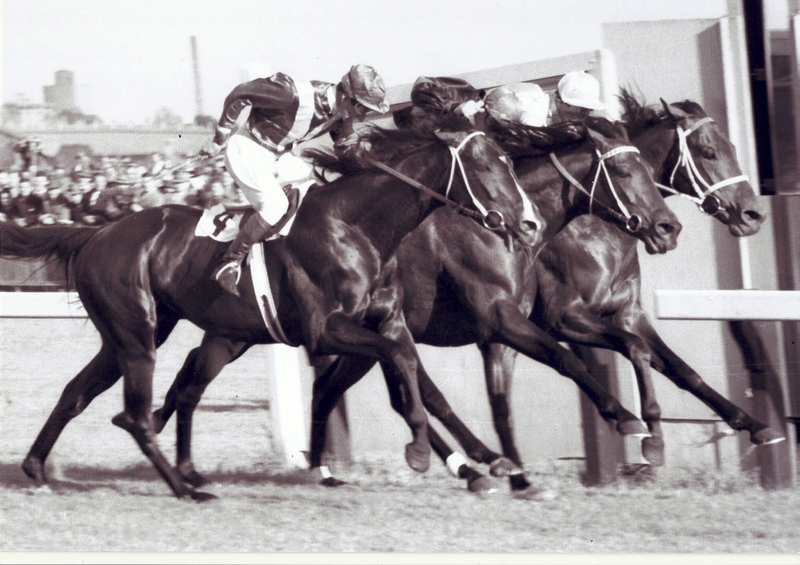 In the early days of Australian racing (and no doubt elsewhere) three race (heat) contests were common to decide the best horses. If there was a tie, that heat didn’t count. It was declared dead and had to be run again. The re-runs died out but the name lasted. I want to conclude with mention that our indigenous brothers and sisters have inspired me with their deeds in many sports. I have taught many in my fifty years as a teacher, and I am still delighted by their speed and skill and by the radiance of so many of their smiles. 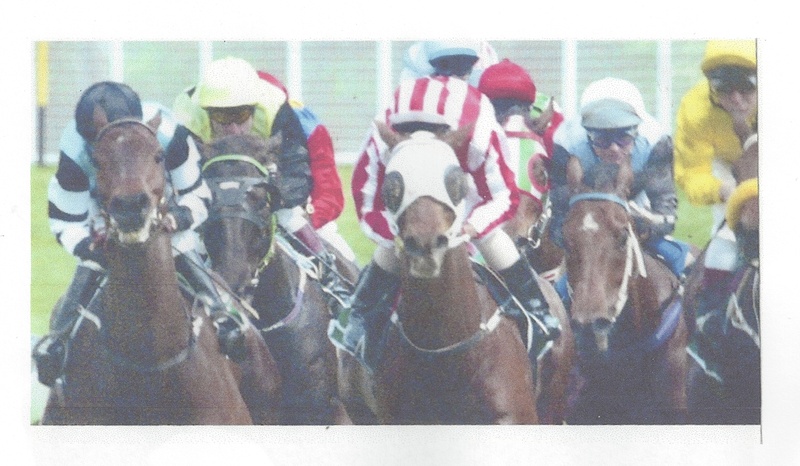 All this is why I want you to visit web site linking us to the history of indigenous jockeys. Ern has talked to me about Darby McCarthy, whom he met quite often. No pictures. Just an ongoing dream of admiration. Now a momentary word to the kind people who have started to “follow” me. Thank you for the encouragement. I am so sorry I have not been more in touch but, you see, I am so busy writing to share all that I want to share before “weight’s right” for my involvement in the human race, that I just haven’t had the time to reach out to you. I long to do this and promise to try to reach you soon. In the meantime, good going and more thanks from octogenarian me. Thank you for your visit. I am working on my post re. 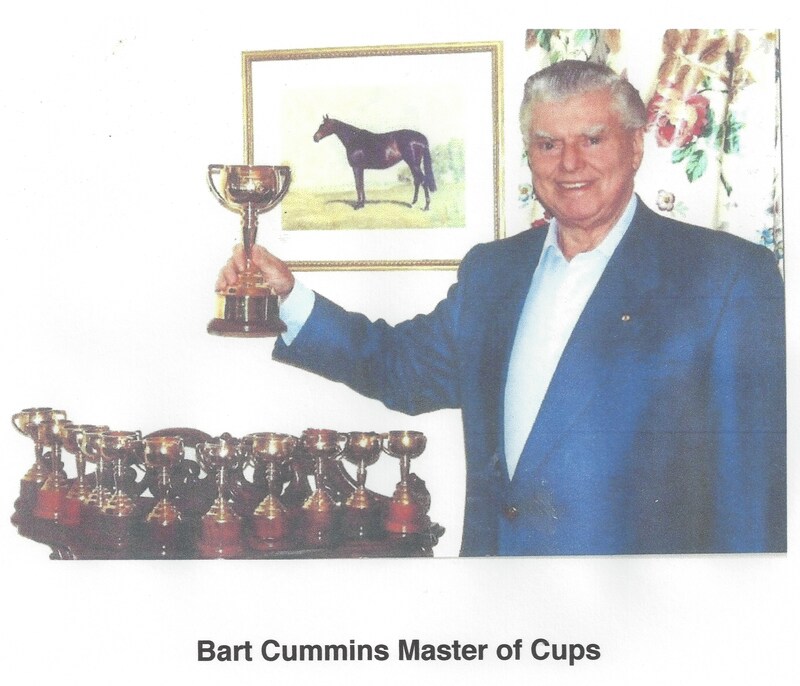 Ern McQuillan’s Melbourne Cup experiences. I hope to finish in time for Tuesday November. ALL IMAGES ON THIS SITE ARE MY OWN OR FROM WIKI COMMONS or public domain since 1955 or McQuillan copyright. IF THERE IS ANY ERROR, PLEASE TELL ME AND I WILL FIX THINGS IMMEDIATELY. ALL MY THANKS TO THE WONDERFUL WIKI SERVICE, AND THE ARTISTS WHO SHARE. ANY VARIATIONS TO IMAGES and comments ARE FOR MY OWN POETIC PURPOSES AND ARE UNKNOWN TO THE ORIGINAL AUTHORs.